Love is…waking up every morning with a kiss, holding each others hand on a walk to the park, and taking the time to say “I love you” each night before you fall asleep. Those are just a few examples of ways that my husband and I show our love for one another, after being together for almost 9 years. Its the little things that count, and when it comes to love – in everything you do…do it well. When I read the SHMILY story, I am not embarrassed to say that I teared up. I couldn’t help but wonder where the years have gone, and what time has in store for my husband and I as we grow old with one another 50 years from now. The short story which was published in “Chicken Soup for the Couples Soul” in 1999, has now been given a new way of being passed down to future generations. What is a SHMILY coin? SHMILY coins are small (1½” round) wooden tokens that can be hidden in your loved one’s wallet, purse, lunch bag, pillow, suitcase, dashboard, under their windshield wiper, in a card, briefcase, or any other place where it is sure to be found with an appreciative smile. SHMILY coins renew the playful part of any loving relationship, whether it’s a spouse, sibling, child or friend. Everyone enjoys being reminded that they are loved–especially when the reminder comes at an unexpected time or place! Who would use a SHMILY coin? Anyone who wants to show their love in an unexpected, thoughtful or fun way! One of the best qualities of a SHMILY coin is that it can (and should!) be used over and over. Each time it is exchanged, the recipient is unsure when or where it will reappear next. SHMILY coins quickly become treasured tokens to share with loved ones at weddings, marriage retreats, family reunions, military deployments, funerals, or other emotional events where it is especially meaningful to show one’s love. I absolutely love the SHMILY story, and the fact that this incredible new concept of the SHMILY coins was born. What a unique, and fun way to show your loved ones…”See how much I love you“. My husband and I have had these coins for a couple weeks now, and we have had so much fun hiding them and surprising one another…some of the places included: the toothbrush holder in the mornings, next to the car keys, and in the diaper drawer (HA!). I thought I would spread the love a little further and sent one to my relatives who lives far away…and they have told me numerous stories of hiding them in their lunch box, or giving the coin to their children for a little encouragement on a day they have a test. The feeling after finding the coins was always ~ JOY, LOVE & HAPPINESS. There is no better feeling than knowing that someone, somewhere truly loves you. I think they coins would be wonderful for a family who may be divorced, or have loved ones who are deployed as well. Perfect for a couple getting married, or for relatives who cannot see each other as often as they would like. It truly is a gift that keeps on giving, which could be used any time of the year. 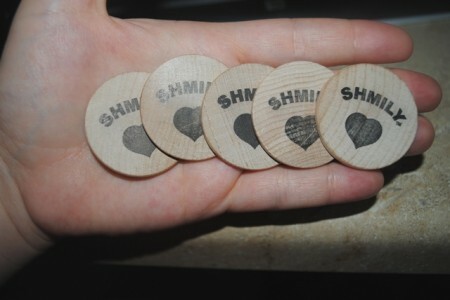 To learn more about SHMILY coins, you can visit their website, like them on Facebook, and/or follow them on Twitter. 1. Enter your name/email address in the giveaway form below (for each entry), so that I can contact you! 2/3. “Like” SHMILY Coins on Facebook and be sure to tell them that Frugal Fabulous Finds sent you (you can add a link to our page too simply by putting the “@” sign in front of our name!) AND tell them where you would hide your SHMILY Coins for your loved ones if you won (on their wall)! Please make sure that you follow this step! It only takes a couple minutes and allows us to get more giveaways in the future! Thank you! Liking FFF on Facebook, liking this blog post via FB, tweeting and more! This giveaway will end Wednesday, October 5th at midnight. The winner will be chosen via Rafflecopter.com and will be announced Thursday, October 6th! Good luck! If you cannot see the giveaway form below, please click here!